- The reference voltage V + driver + V socket RGB object. In all cases, be estimated power requirement by aggregating power ratings of all the receivers, and then select the power supply slightly greater than calculated.For larger installations, there are several smaller power supplies, it is the individual that is the power of certain groups of modules. The traditional (classical) strips, LED ribbon strip can be combined in a chain, which causes the light it can be easily and practically possible for every beginner fitter to connect several modules together into a single adapter. One bulk power supply can be placed in a central site, then create a parallel chains, which can be deployed in different directions. Connecting the controller requires a four-wire RGB cable. The power supply is connected only to the controller. 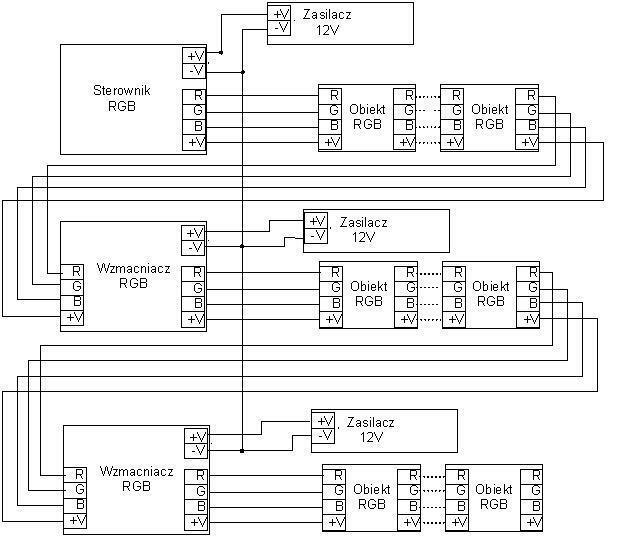 Another RGB modules can be combined in a string as shown below..
You can put one rówież bulk power supply in the central site and then connect objects (tape) RGB parallel chains, which can be deployed in different directions. Separation of the signal can also be made between two objects (taąmami), not necessarily in the output driver. Often, the driver output power (typically 120-180W) is not sufficient to handle the whole set of receivers RGB. 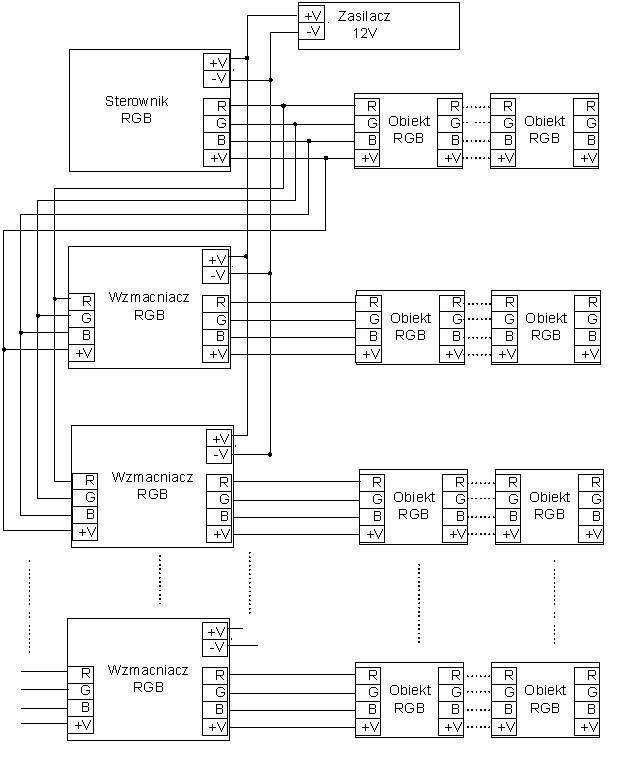 Then the loads should be divided into groups of RGB lower capacities, and to use the so-called. RGB amplifiers. In the situation shown in Figure RGB amplifiers apply to the bulk power supply it is important that the total power receivers connected to the amplifier is not greater than the nominal power amplifier RGB. 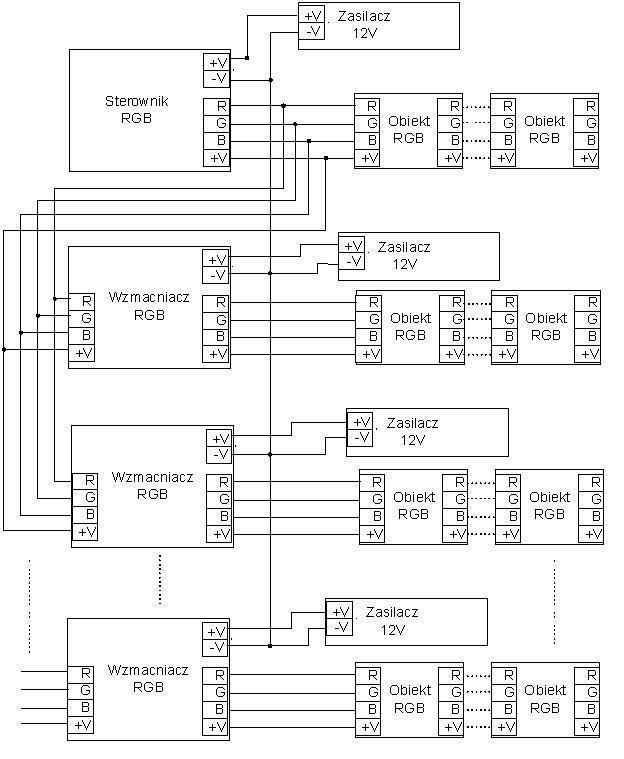 You can combine multiple amplifiers in parallel RGB with each other. In the version with an individual power supply for each amplifier, care must be taken by cons out power cable connected to each other that all the power to bring to a potential. Amplifier inputs to be connected directly to the controller's outputs RGB, but blocks can be further combined in a single chain.